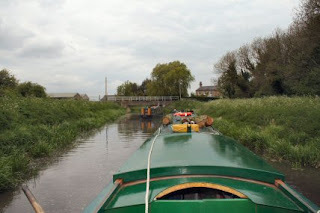 If you want a trip that will test your skills at the helm then go up towards Sleaford. The day started well enough but it was a bit disconcerting to be able to see the bottom and the sides of the canal all at the same time. It is a slow plod along with the boat grounding at several points as we went on. 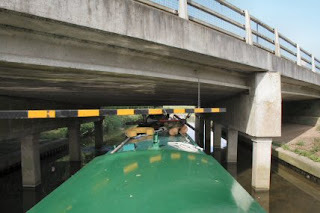 Arriving at South Kyme is with a sharp bend and before you realise it there is a low bridge straight in front of you. The chimney took a bash from the hanging height indicator. With a little shuffling of the gear on the roof and I got through. The centre of Kyme is very pretty but narrow and full of trees overhanging the canal. As you travel along through the village there are even more trees on both banks and take a lot of dodging. At the next bridge I had to drop the mirrors on the motorbike to get under. 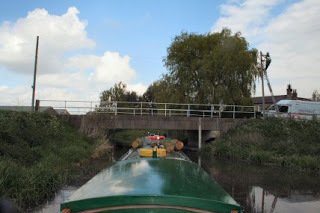 After the last bridge a sharp bend and before very long I was aground. There was no way that I was going to get to Cobblers Lock and winding hole. So the long trek in reverse started. Going in reverse is not one of the things that a narrowboat is designed for and this one is a pig. Getting past all the trees with the wind blowing across the canal was difficult. The bows, no matter what I did were blown over to the bank. 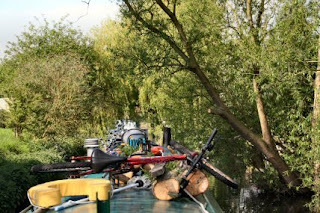 I spent the whole day getting back to Bottom Lock and it was a relief to get the boat into ahead motion again. All in all a day to be missed. 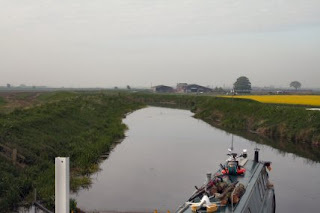 The major problem with the canal is the lack of a winding hole anywhere near South Kyme. There is a place just outside that just needs a bit digging out and it would be perfect. 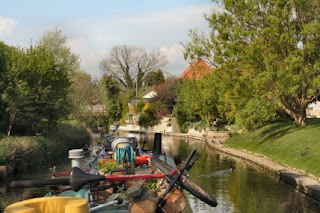 If you still want to visit the thing to do it seems is to go in a pair and one boat tows the other which is in reverse. 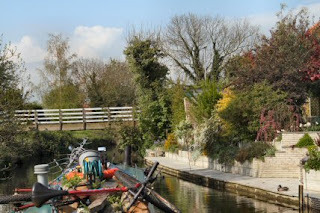 At the end of the visit one of the boats is then facing the right way and can repay the tow to get back to Bottom Lock.